Oh boy, do I really need to recap the Bengals week 10 game against the Saints? Do we all remember the 500 plus yards and 50 plus points the Saints put up on the Bengals? Or do I need to mention that the Saints punter wasn’t used once in the entire game? Or how the Bengals starters managed to only put up just seven points against the 31st ranked defense in the league? Do we all remember this? Good, because I don’t want to talk about it anymore. This week the Bengals face another tough task. That is going into M&T Bank Stadium and facing a divisional rival, the Baltimore Ravens. Like the Bengals, the Ravens are also in the wild card playoff hunt and a win against the Bengals would give the Ravens matching records with Cincy. In order for the Bengals to keep their playoff hopes alive, they can only afford to lose two games max the rest of the year. And with games still left against the Chargers and Steelers, they cannot afford to lose this week. They will have to be sharp against a very good Baltimore defense. Tyler Boyd vs. WR1 Coverage – I listed it last week and I will list it again this week. Marvin Lewis isn’t closing the door on A.J. Green playing this Sunday, but we all know that is a total smoke screen. We will not see A.J. Green Sunday, and that is that. Tyler Boyd MUST continue his breakout season against the Ravens top corners, Marlon Humphrey and Brandon Carr. The Ravens defensive backs have already publicly stated their plan to keep more eyes on Boyd. This could be his toughest game of the year. Andy Dalton vs. The Ravens Secondary- The Baltimore Ravens secondary is good. They are averaging the 3rd fewest passing yard per game this year with an average of just 205 yards allowed through the air. Andy Dalton will have his hands full this weekend, especially with no A.J. Green. The last time the Bengals faced the Ravens Andy Dalton carved them up for 265 yards and 4 touchdowns, but that was with a healthy A.J. Green. Good Andy will have to be out in full force in order to get anything going against this stingy pass defense. The Bengals Defense vs. A Backup Quarterback- The closer and closer we get to Sunday it becomes more and more evident that Joe Flacco isn’t starting. However, that doesn’t mean we are any closer to knowing who will start. The Ravens are keeping quiet, not telling us if Lamar Jackson or Robert Griffin III will get the start on Sunday. It is looking like it will be Griffen. Regardless of who gets the start the Bengals must take advantage of a backup getting the start. My Prediction:The Bengals are one game removed from a blowout loss and have recorded three straight games where they given up 500+ yards on defense. I think the combination of a backup quarterback starting for the Ravens and Marvin Lewis taking over the defense, leads to the Bengals defense getting a little more on track. While the Bengals linebackers are all banged up, the rest of the defense should be able to step up. The Bengals seem to always have the Ravens number. It will take everything they have but I believe the Bengals escape with a win. Be sure to follow me on twitter @Pierson242FF. Be sure to tweet me anything Bengals related, questions or comments! Welp, we’re halfway through the 2018 season – and for Cincy fans, things ain’t looking too bad. The team stands at 5-3, including a win against AFC North foe Baltimore. That’s the best start since going 8-0 in 2015 (which feels like a helluva lot longer than three years ago). They are 3-0 against the teams with whom they are in wild-card contention (Ravens, Dolphins and Colts). Five remaining games are against teams with losing records. If the receiving corps can hold together until A.J. Green gets back from a foot injury, and the offensive line continues to gel, and Vontaze Burfict quits playing like he’s trying out for the Cleveland Browns, a postseason trip could very well be in the cards. By the way … some of those players we just mentioned, they deserve mid-season mentions for their accomplishments. Or lack thereof. 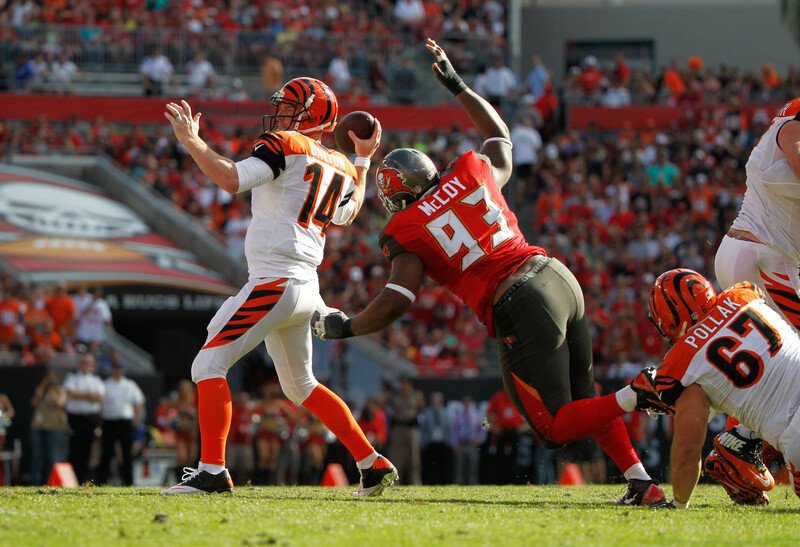 MVP – Andy Dalton: Halfway through the year, Dalton has thrown for 2,102 yards and 17 touchdowns. The latter of those is tied for eighth in the NFL with Tom Brady and Ryan Fitzpatrick. We’re not saying we’d take him over Tom Brady at this point … wait, yes we are. Surprise player – Trey Hopkins. Offensive guard Trey Hopkins had to show hustle to move up from the practice squad in late 2016. He had to show it even more to earn 12 starts in 2017. Through the first half of this year, he has shown us – and all Cincinnati Bengals fans – that he’s the real deal. Didn’t see that coming. Rookie MVP – Jessie Bates. Now this is the way to make a first impression. Rookie free safety JB has racked up 60 tackles this year, defended four passes, picked off three others, and scored a touchdown. The last time a Bates was this scary, he was stabbing Janet Leigh in the shower (kids, ask your parents). Most disappointed in – Vontaze Burfict. Vontaze browned the bed by getting suspended for the first four games of the year for using PEDs. He’s only tallied 17 tackles so far and the Cincinnati Bengals’ defense has fed off that, which puts them on par with the worst Ds in the league. They are 30th in total yards allowed, 25th in rushing yards allowed, and 19th in sacks. Granted, they are tied for sixth with 10 interceptions, so we’ll throw ’em a bone there. OK, Cincinnati Bengals fans – the week is here. The Metal People are coming to town. Even better, they’ve looked as soft as melting gold so far this year. Those from the “pit” are ripe for the picking. Notice how we haven’t named them yet? That’s because, with some teams, you just dislike them so much that you want to say their name less than Voldemort. And there’s a reason for that hatred. In fact, there are several. Cincinnati and the pit town have had more than their fair share of run-ins over the last few years. That has mushroomed into a pretty fierce rivalry – one that would give Da Bears!-Packers historic rivalry a run for its money. Here are five moments/games that have really brought this thing to a head. And made us want to rip someone’s head off. The sting of this one is still fresh. It’s December 2017 and the Cincinnati Bengals are still hoping for a playoff bid. But the black and gold team stopped them cold, with some help from the black-and-white striped team. The Bengals were flagged 13 times for 173 yards (a team record). Many of those were the result of poor officiating. The worst was a BS holding call against Giovani Bernard in the second half that wiped out an Andy Dalton touchdown pass. It was such a phantom call that you half-expected to see an opera along with it. The TD – and the momentum – was officially lost. Along with a 17-point lead, the game, and the postseason. The first playoff meeting between the two teams was in 2005. The stakes were high, the tension higher. Said tension reached a fever pitch when Bengals’ QB Carson Palmer was drilled on the second offensive play (in what many people thought was a late, dirty hit) and left the game with a knee injury. Cincy still managed to take a 17-7 lead, but the bottom fell out after that. The Other Team scored 24 straight and won 31-17, paving their way to a Super Bowl title. 2. You’re Late … Again and Again and Again. If you thought one late hit was a doozie, how about a second half full of them? That’s what we witnessed in the 2015 Wild Card Playoff game. Things seemed reasonably calm in the first half. Then the rain started falling … and the bodies. Assistant coach Mike Munchak pulled Reggie Nelson’s hair. Giovani Bernard was on the receiving end of a Ryan Shazier helmet-to-helmet tackle. Vontaze Burfict and Pacman Jones donated 30 yards in penalties to the Make-a-Field-Goal foundation. Even Ben Roth ….Roethles …. Roethlis … Big Ben was pelted with garbage as he was carted off the field after being sacked by Burfict. Where were the WWE superstars to make it a complete circus? 1. You Want Somma This? Well sorry, it’s ours! The 2009 Iron Workers football team allllmost qualified for the playoffs at 9-7. How sweet was it then, that two of those losses were to the eventual AFC North champion Cincinnati Bengals? Because, ya know, without those two losses, Pitt would have made the postseason. Claiming a playoff spot with one hand and shoving your heated rival away from it with the other hand? Ummmm, yes please! Could 2018 Be Tyler Boyd’s Year? Never send just a man to do a Boyd’s job. Sounds like a cool slogan for a t-shirt, right? Well, it’s more than that. With Cincinnati Bengals wide receiver Tyler Boyd coming into his own as a viable target for Andy Dalton, that slogan could become the newest way to express how Bill Lazor’s offense will wreak havoc on opponents in 2018. Getting to that point though hasn’t been a sure thing at times. The Bengals had reasonably high hopes for Tyler Boyd, drafting him in the second round out of Pitt in 2016. He brought a 6’2” frame and 4.58 speed to the team. Cincinnati penciled him in third on the depth chart behind Brandon LaFell and some guy named Green. Boyd wasted no time jumping into the fray in 2016. He played in all 16 games and snagged 54 passes for 603 yards and 1 TD. Those are solid totals for a second rounder, especially when you consider that his role was mainly to complement Green and LaFell. But last year, those numbers dipped more than the chorus of Freak Nasty‘s single Da Dip. (You know; I put my hand upon your hip …). Boyd suffered a knee sprain and only played in 10 games. He was targeted only 32 times, and caught 22 of them for 225 yards and a couple of TDs. To boot, he was in Marvin Lewis’ doghouse for reasons that even the cast of True Detective would have trouble figuring out. Through the first 3 games of 2018, Boyd has 15 catches for 249 yards and 2 touchdowns. That’s a healthy 16.6 yards per catch and a yardage total that already surpasses last year. Those numbers should keep growing nicely as Boyd gains experience and assumes a larger role in the offense with LaFell now in Oakland. Boyd is a good safety net/checkdown for Dalton and will team with Green to give the Cincinnati Bengals a powerful 1-2 punch. It’ll be enough to give secondaries that same dejected feeling you get when you’re jonesing for some Chick-fil-A … and then realize it’s Sunday. Here’s to Tyler, whom we hope will continue to look like a man among boys.